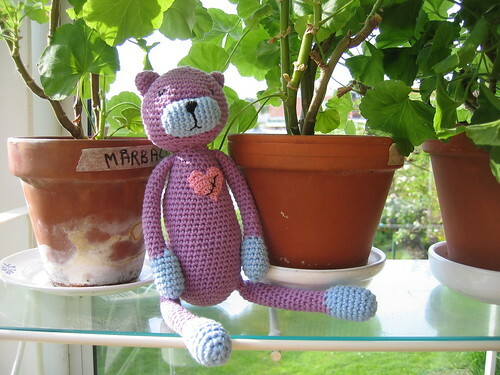 The Heart Cat (Hjärtekatten) is a Swedish Craft Project that I joined when it started this spring. 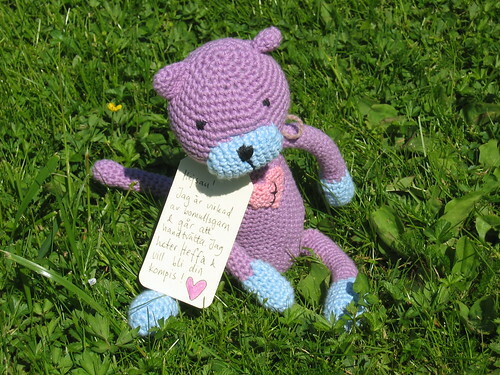 It started when two Swedish women in Gothenburg sent out a call for crocheted softies to give to children that suffers from some kind of heart disease. Something that will remind the child and their family of that time, and to let them know they are unique and special, not just sick. Something to hold onto when you’re worried or scared. 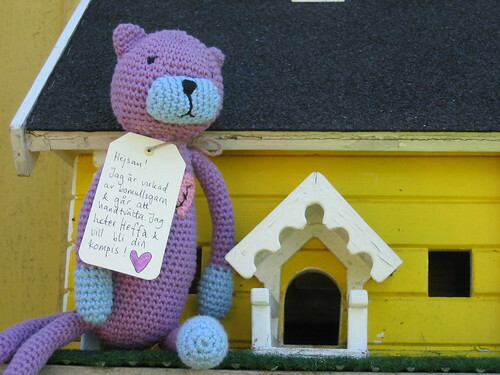 Each cat is lovingly crocheted and put together by volunteers all around Sweden, people like who likes to crochet and do something nice for someone at the same time. 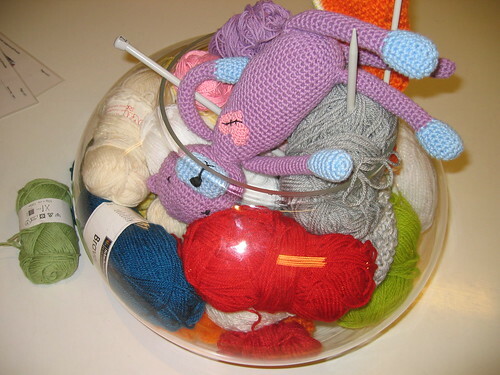 Their first goal was to collect 100 handmade cats to distribute at a local specialist hospital (Children’s heart ward at Queen Silvia’s Children- and Youth Hospital), but as I’m writing this I see my crocheted contribution, named Heffa, in the pile in this post and the count was at 461 cats! Now it’s probably a lot more than that – and the pile is growing! At first I was thinking of the heart on the softies chest as a sad “broken heart”, but really, if you look closer, you can tell it’s a mended heart with a scar. Each cat will be a reminder of the hospital stay and the experiences there. 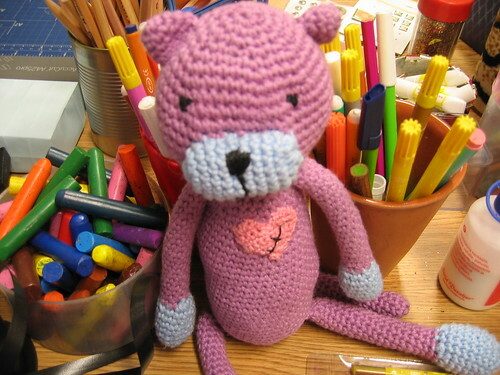 I used to free-hand crochet a lot of amigrumi animals a few years ago. I love creating the parts and seeing the softie being born when I sew the parts together. It’s been a while since I did the last one, so I really enjoyed creating a cat and I become quite attached to him. Maybe I liked him even more because I knew he was not going to stay around very long? 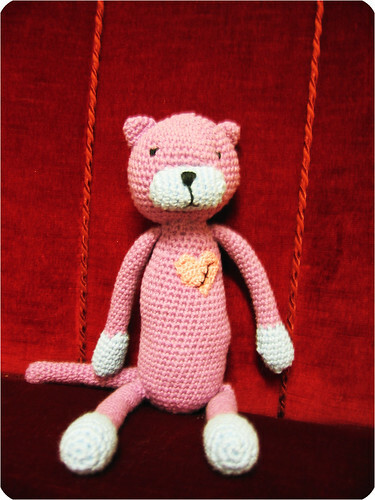 I named the heart cat that I crocheted, Heffa, and attached a note around his neck before he left. It’s says “Hello my name is Heffa, do you want to be my friend?” and on the back is my name and email. I am hoping I will receive a note back once Heffa finds his new parents, maybe even a photo of him together with his new child? That would be fun. The cat and I had a few adventures together that I documented before he left. I got quite attached to him, and his funny ways! His stay here was short but sweet – and creative of course, as always around here. Outside the bird feeder house. 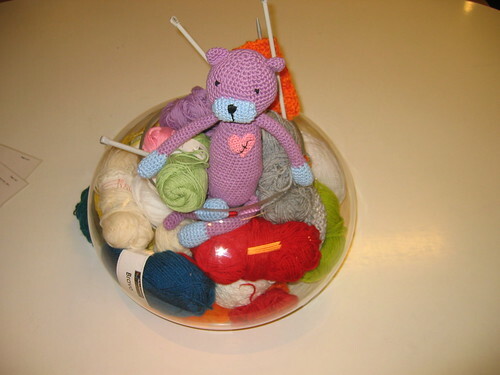 Fooling around in the yarn bowl at work. – Look at me! I can stand on my head! Heffa, did you know that’s the bowl where I found the purple yarn that I crocheted you from? It’s your origins and siblings in there. Indoors, resting. 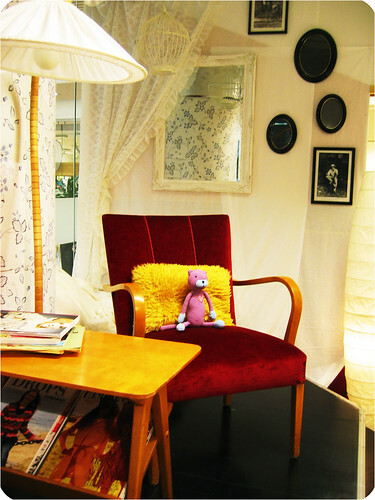 He is very good at finding a spot good enough for napping (like most cats), becaue that’s his favorite activity, though he also enjoys drawing and painting and sewing etc. Time to take out the pens and go draw something. 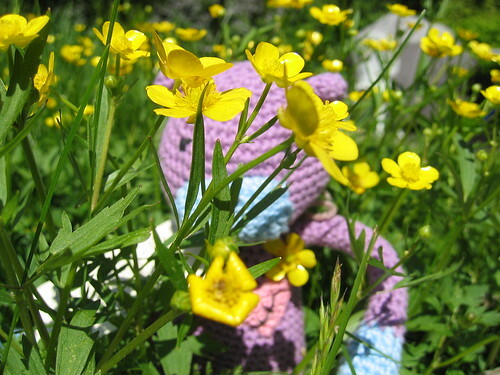 This entry was posted in Crafts and tagged amigurumi, charity project, crochet, gift giving, health, softies, toy making. Bookmark the permalink. I love joyful, giving projects like this. Kitty Cat= gorgeous. What a cutey. And thank you for the news of the new url. I am a subscriber and love your blog. Oh, what a sweet project! Your cat is great! 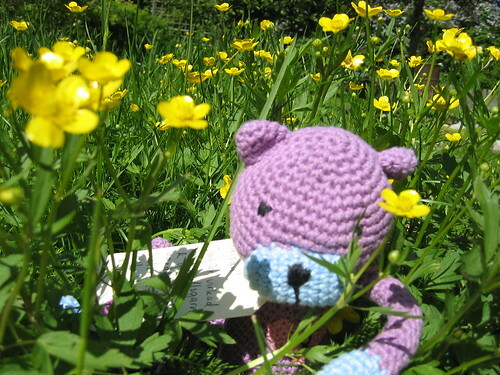 I really want to learn how to crochet this kind of toys, this summer (I’m going to order a book about this topic!). I want to tell you that, by mere coincidence, my italian etsy team is working in this days to a similar project. We are realizing various objects with hearts and we are going to sell them: all the money will be donated to an italian medical organization that helps people with a particular heart problem (a member of our team has this illness). This is really so sweet, Hanna. gorgeous! your heart idea was very thoughtful too. What a beautiful story and project. Some lucky kid gets to adopt Heffa now!